And spin ning up a storm. 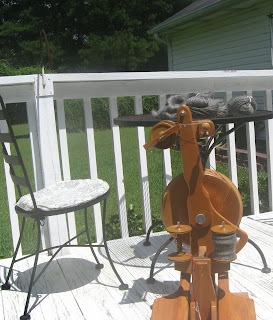 Or, since school has started and vehicles have been cranky, I've been spinning up some dust. And here is the Gotland started. Looks quite different inside and outside, colorwise it's right in the middle. 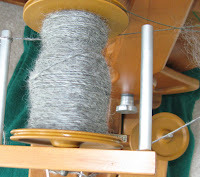 It spins up nicely, easy to work with, but makes a hairy sort of single. 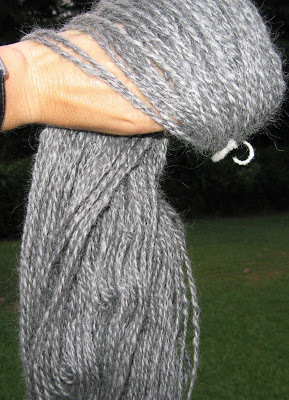 I'll be interested to see how it looks plied. Other fun things lately include making these chocolate chip cookies. Thanks NYT! Slow and steady may win races, but it hasn't produced many interesting pictures for this blog lately. Here's the linen stitch pull over, with some pockets. I like it, not sure about the pockets yet. I really need to get Soryu finished so I can start on the Gotland. 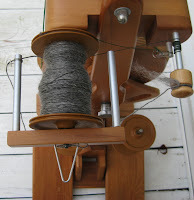 I look at other people's blogs and they are doing all this lovely, lovely very fine gauge spinning in gray and I want to too . . . If you haven't been to the American South in late July and early August, you probably don't know the distinctive, grape bubblegum smell of kudzu. The stuff that makes trees along the roadside look like Snuffaluffagus. We've been biking a lot lately and so I've been seeing, and smelling, kudzu a great deal. It's a fascinating thing, kind of scary, like "the thing" (it grows up to 3 feet a day and according to Frommer's caused the only known plant-induced baseball game delay). But it's also quite pretty in bloom (sort of looks like lupine, I think) and the leaves have a pretty heart shape, while the runners turn into these intricate corkscrews. Anyway, these images are sort of calling to me to design a sweater around them this fall. Just stitchwork, or maybe colors, or maybe both? All the other projects are still chugging, slowly, so pics later in the week I guess.